Double Tourbillon: Each Tourbillon is an independent mechanism which rotates on it own axial every 60 seconds. The 2 Tourbillons are connected by a series of differential gears. The differential then transmits the combined mean (average) time of the two Tourbillons - allowing for an even more accurate/precise method of time-telling. The double Tourbillons are mounted on a plate - which couples as the dial. The plate itself rotates once every 12 hours allowing for simultaneous rewinding of the twin-barrels. The current hour is displayed by a hand mounted on the bridge which connects the two Tourbillons which makes 1 revolution every 12 hours. 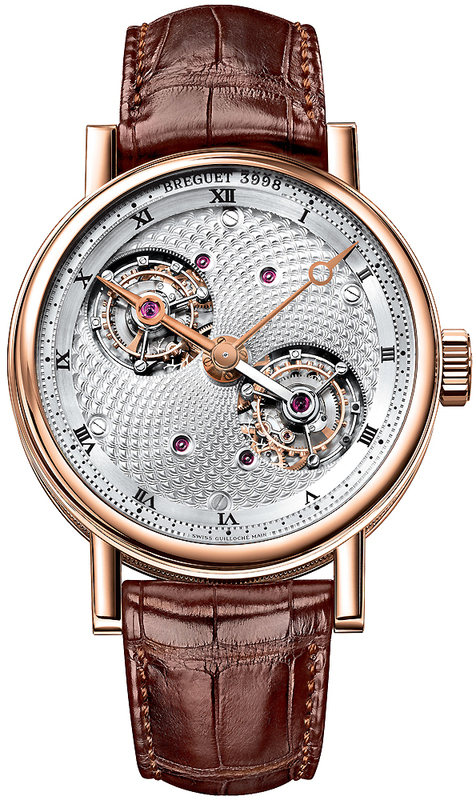 Breguet Caliber 588, contains 69 jewels & has an approximate Power Reserve of 50 hours. Polished solid rose gold case with Breguet's signature coined edge. Silvered Guilloche textured Tourbillon plate center of dial. Hour & Minute chapter ring flange is made of 18kt Gold with a silvered finish. Black painter Roman Numeral hour markers & got minute markers. The back of the movement - visible through the sapphire crystal case back - bears a spectacular hand-engraved diagram of the solar system, inspired by the 60 second rotation of the 2 Tourbillon cages and the 12 hour rotation of the center dial bearing the Tourbillons.